Marinda is a visha kanya. A poison maiden. She was infused with snake venom as a child, making her both immune and lethal. With a simple kiss, she can kill. She works for the kingdom, killing enemies of the Raja. Marinda feels horrible guilt over what she is doing, but she does it to protect her brother and her kingdom. That is, until the day she is assigned to kill Deven, her only friend. As she embarks on a mission to save him, Marinda begins to unravel all the lies that have been told to her throughout her life. Overall, Poison's Kiss was enjoyable, but it didn't blow me away. It was a pretty short book, and I felt that it could have benefitted from more exposition. There wasn't anything that I would necessarily say I didn't like about the book, but I needed more. The characters were enjoyable, the world was interesting, and the plot was intriguing - but it could have been so much more. The characters were all pretty well written and developed. I particularly loved Deven and Mani, Marinda's brother. They had a great relationship that was adorable to watch. There were also some truly vile villains in Poison's Kiss, and they were some of the most interesting parts of the book. Kadru, the snake charmer, was intriguing and disgusting and terrifying all in one. I honestly think it would be more interesting to get a backstory on her than to continue with Marinda's story in future books. I had a bit of trouble understanding the world in this story. I would think I had a good picture of it in my head, and then something would be described that felt anachronistic. I wasn't sure if we were in a completely made-up fantasy world or something based more on modern-day India (or something in between). There were great descriptions of the world, but the pieces didn't seem to fit together, so I couldn't get a clear picture of what it was like in my head. The plot was really interesting, but I think the pacing was a bit off. The first half of the book was pretty slow. Not very much happened until much later in the book. Then suddenly twist after twist appeared and the action was nonstop. The twists were good, but it was a bit jumpy at the end. Again, I think this is because the book should have been longer so these things had more time to develop. 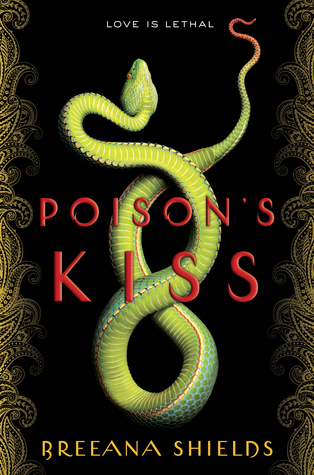 All in all, Poison's Kiss was enjoyable and I'm glad I picked it up, but it's definitely not a favorite of mine. It was a really quick and entertaining read, so I recommend giving it a try if it's something you've been wanting to read. I don't think I will be continuing with the series, though, because I really don't care enough about what happens to the characters and I already forgot how the book ends...oops.